Instead of using two or three different colors of ink for your next stamping project, just use the second generation technique. For these two flowers, I inked my stamp with a dark red ink. After stamping, without re-inking it, I stamped the second image. This uses the same color, just a lighter shade of it. This is a great technique for saving time and energy, plus you don't have to color match as you work. Because it's the same color, each generation will be in the same color family. If you've inked really well, you can even do a third generation, one that's very light and very beautiful. 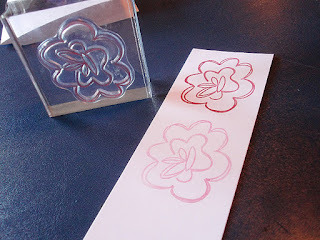 Stamp a couple of times and cut them out, then stamp a couple more on the paper itself. The variety of shades will add some visual interest because they all go together. 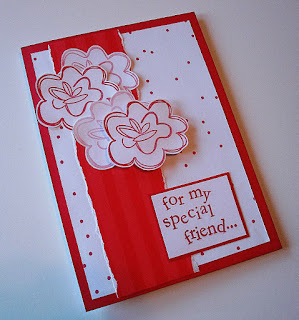 This is how I used my second generation flowers - layering them and raising one on 3D adhesive. They will always coordinate and you don't even have to think about it! Yay! This card, along with many other cards and paper gifts, can be found in my etsy shop: http://www.stufffromtrees.etsy.com/.